Description: This is a survey course that will teach students the basics of engineering. Students will learn how to design physical objects using 3d software. They will build and program robots using VEX robotics and Robot C. They will also document design ideas and concepts. A $20 fee is required for this course. Description: This course expands on the basics taught in Engineering I. Students will work with other students to design and build robots to compete in multiple competitions. The focus of this course will be on understanding project management and how to take a project from inception to completion using industry standard tools and resources. 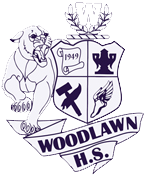 Participation in Woodlawn’s FIRST Tech Challenge Robotics Team after-school program is required. A $20 fee is required for this course. Prerequisites: Engineering I and teacher approval. Description: This is the capstone course of Woodlawn’s Engineering Program. Students will work in small independent teams to identify a real-world problem, design a solution to that problem, and present the solution to real-world engineers. Students will be using all of the tools that they acquired in Engineering I and Engineering II. There is a $50 fee for this course which includes the fee for participating in the FIRST robotics competition after-school program. Participation in this competition is a requirement of the course. Prerequisites: Engineering I, II and teacher approval. Description: This course places emphasis on the organization, structure, research, and delivery required in public speaking. This course will also help students to acquire formal oral communication skills. Description: In this course, the study of speech is extended to include the total communication process. Interpersonal communication is emphasized and various elements of group discussion, decision making, and speech analysis are studied. Description: The E2020 program is offered to seniors who need to repeat a required course to graduate. Student must be a self-directed learner. The following courses are available: English I, II, III, & IV; Algebra I & II; Geometry; Financial Math; American History; World Geography; World History; Civics; Biology; Physical Science; Chemistry; and Environmental Science.